Mumbai-based ANI Technologies Pvt Ltd, which runs online cab booking service Ola (formerly Olacabs), is said to have raised around $225 million (Rs 1,478 crore) in a fresh round of funding from existing investors Falcon Edge Capital, Tiger Global Management, SoftBank and others. The development was first reported by Mint quoting documents filed by Ola with the Registrar of Companies (RoC). The news report suggested that Ola could secure up to $500 million on closing of the current funding round. Spokespersons for Ola and Tiger Global did not respond to queries till the time of filing this report. A SoftBank spokesperson declined to comment. The fresh tranche, which comes less than six months after Ola raised $400 million in a round led by Russian billionaire Yuri Milner's investment firm DST Global, takes the total capital raised by the cab aggregator to over $900 million. Other existing investors Steadview Capital, ABG Capital and FII LTR Focus Fund have also contributed in this round along with new investors JS Capital (M) Ltd, Parkwood Bespin and Daniel E Neary. The news report said Ola issued shares at a price of Rs 29.4 lakh apiece in the latest round. This is almost double the value of shares allotted to Tata Group chairman emeritus Ratan Tata and former Vodafone Plc CEO Arun Sarin in May and August, respectively. Tata and Sarin had picked up shares at Rs 15.8 lakh per share. Tata had made the investment in his personal capacity. Sarin also joined the company's board of directors. Ola, which competes with San Francisco-based Uber, has set an ambitious target to reach one million drivers on its platform in three years. Currently the service has over 100,000 drivers, a number that has grown from 10,000 a year ago. It had earlier raised $277 million from SoftBank, Tiger Global, Matrix Partners, Sequoia Capital and Steadview Capital, among others. In October 2014, Ola also raised $210 million in a funding round led by SoftBank. In July, the company had launched Ola Store, a hyperlocal grocery and daily needs delivery app. It has also ventured into the food and beverages space with 'Ola Cafe', its food ordering and delivery service in parts of Bangalore, Hyderabad, Delhi and Mumbai. It recently launched opened its mobile wallet for transactions on budget hotels aggregator OYO Rooms and other e-commerce platforms. 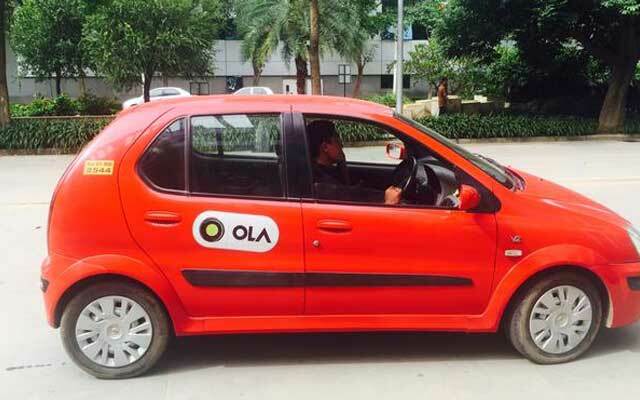 Ola is also set to introduce its shuttle bus service on September 21 with 500 shuttles in Bangalore and Gurgaon. Meanwhile, Ola said on Monday that it will invest Rs 5,000 crore in the coming year to expand its newly formed cab leasing business. It will be investing Rs 500 crore to begin with, and will raise funds independently for this subsidiary in the time to come. The Mumbai-based firm has also roped in former LeasePlan India executive Rahul Maroli as vice president (strategic supply initiatives) to head the leasing business that will operate as a fully-owned subsidiary. Ola is in advance talks with leading car manufacturers and financial institutions to enable this model for over a 100,000 driver partners by the end of 2016. By December 2015, at least 10,000 cars are expected to be on-road under the leasing model, it said.